Give acetaminophen for pain if delay in hospital treatment is anticipated. Antivenom.Antivenom (also called antivenin) is available for many snakes, and is indicated for severe envenomations by Viperidae family snakes and most envenomations by snakes of the other poisonous families. Antivenom is best given as soon as possible after an envenomation, but may be of value up to a few days after a bite. If possible, antivenom specific to the snake should be used. Otherwise, a polyspecific antivenom may be used. READ THE PACKAGE INSERT OF THE ANTIVENOM FOR VALUABLE INFORMATION. Epinephrine and diphenhydramine must be available, as allergic reactions (including anaphylaxis) to antivenom have occurred (they are often prepared from horse serum, which some people are allergic to). Antivenom is diluted (for example, 1:10) and given at 5 ml/minute IV, and the dose is based on stopping the progression of signs and symptoms, not the victims body weight (the childrens dose is the same as the adult dose). For neurotoxic snakebites, if there is no improvement in 30 minutes, the dose should be repeated. For Viperidae (which can cause bleeding disorders), spontaneous bleeding should stop after sufficient antivenom is given; continue giving antivenom until bleeding stops and progression of swelling is retarded. Because you may need to administer antivenom a number of times, one vial may not be enough to treat a patient. Antivenom is available via PCCs and hospitals. It may also be available at zoos and embassies. The Donts of Snakebite Treatment.The following are the donts when it comes to treatment of snakebite. DO NOT use any ice or cooling on the bite. DO NOT use a tourniquet. Obstructing blood flow can make local tissue injury much worse. DO NOT use electric shock. DO NOT make any cuts or incisions in the wound. Cuts at the bite site may impede circulation and promote infection and make local tissue injury much worse. DO NOT give victim alcohol or narcotics. Further information may be obtained on an emergent basis from a PCC or from Arizona Poison Control, (520) 626-6016. Bites, Stings, and Punctures from Sea Animals A number of sea animals are capable of inflicting painful wounds by biting, stinging, or puncturing. Except under rare circumstances, these stings and puncture wounds are not fatal. Major wounds from sharks, barracuda, moray eels, and alligators can be treated by controlling the bleeding, preventing shock, giving basic life support, splinting the injury, and transporting the victim to a medical treatment facility. Minor injuries inflicted by turtles and stinging corals require only that the wound be thoroughly cleansed and the injury splinted. JELLYFISH INJURIES.Other sea animals inflict injury by means of stinging cells located in tentacles. This group includes the jellyfish and the Portuguese man-of-war (fig. 5-5). The tentacles (which may be impossible to see, even in relatively clear water) release poison or tiny stingers through which poison is injected into the victim. Jellyfish stings may cause symptoms ranging from minor irritation (pain and itching) to death. Contact with the tentacles produces burning pain, a rash with small hemorrhage in the skin, and, on occasion, shock, muscular cramping, nausea, vomiting, and respiratory and cardiac distress. Treatment for minor jellyfish injuries consists of pouring sea water over the injured area and then removing the tentacles with a towel or gloves. Next, pour rubbing alcohol, formalin, vinegar, meat tenderizer, or diluted ammonia over the affected area to neutralize any remaining nematocysts (minute stinging structures). 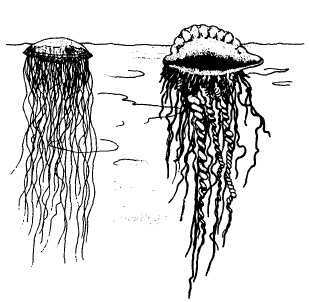 Finally, cover the area with any dry powder (to which the last nematocysts will 5-14 JELLYFISH PORTUGUESE MAN-OF-WAR HM3f0505 Figure 5-5.Jellyfish and Portuguese Man-of-war.